If you've recently moved into a home with an oil heating system, or you haven't given your oil tank any thought lately, then it's probably time to deal with it. Your oil heating system is what's going to keep you warm during the cold months. The last thing you want is for your family is to run out of oil during the winter. Especially once the harsh weather conditions hit, you might find yourself unable to get your oil tank filled for a few days or even weeks. If you are looking to replace your existing heating oil tank, then you're likely wondering if you'll need a different size. The first thing to know about buying a new oil tank is what size you'll need. This is so that you can calculate the right amount of oil to purchase. If your existing oil tank is outdated and needs replacing then this is a perfect time to consider other oil tank options to meet your consumption requirements. If you own a home that uses oil as its primary source of energy for heat, then you're not alone. According to the U.S. Energy Information Administration, there are an estimated 6 million homes in America that use oil as their primary fuel source for space heating. While some smaller homes may still use oil to heat their water, the main purpose of heating oil is for space heating inside homes. Because heating oil is used to heat so many households, heating oil consumption is highly seasonal and regional. 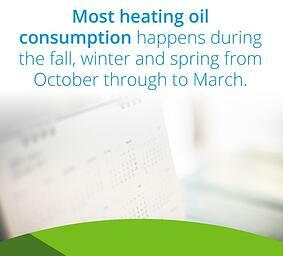 Most heating oil consumption happens during the fall, winter and spring from October through to March. Also, the majority of heating oil consumption occurs in Northeastern United States households. The lowest amount of heating oil consumption occurs in Western United States households. Of course, this is due to the vast difference in heating needs between these two coasts due to climate. As a homeowner in the Northeastern region in the United States, it's possible that your home's primary source of heat will come from heating oil. This means that you should familiarize yourself with your heating needs, including the home oil tank size you need. Know How Much Oil You Have Left: By knowing your tank’s capacity, you’ll know how much oil you have left. Some older oil tanks don’t have gauges that tell you when you’re running low. If this is the case with your oil tank, there’s a simple calculation you can make to determine how much oil you have left. We’ll cover this in more detail later. Know How Much Oil You Need to Purchase: If you know the size of your oil tank and the amount of oil you have left, then you can figure out how much you need to purchase to get you through the winter. This helps with household planning and budgeting. Have a Better Understanding of Your Consumption: It’s also important for families to just be aware of their heating oil consumption levels. This can help you be a more conscious consumer and conserve heat when you have the opportunity. Prevent Running out of Heat: Finally, the most important reason to know what size oil tank you have or need to purchase is so that you don’t run out of heating oil. Running out of heat during a winter storm could be devastating, especially if you have little ones in the home. If you need a new oil tank because your family has doubled in size, then you know you’ll need a larger tank. But if you’re upgrading your tank simply for safety reasons and your consumption habits haven’t changed, then your purchasing decision may be easier. Once you’re clear on what your reasons are for upgrading your oil tank, then you can figure out what size oil tank you need. The first thing to know about heating oil tank sizes is how the measurements work and what home oil tank sizes are available. Residential heating oil tank capacity is measured in gallons. The amount that it takes to fill the oil tank is the total capacity of the tank. You may also hear people talk about the size of the tank itself as measured in inches by its height, width and depth. Knowing these measurements can also help you determine the tank's capacity. Before you decide what type of oil tank you need, it's smart to figure out what the existing capacity is. If it's an older tank, then it probably won't have a label on it indicating its size. However, modern tanks all have a size label on them, which makes things easier. If yours doesn't have a label, you'll have to get out the measuring tape and calculate the size yourself. There are different types of oil tanks, each type with their own standard size ranges. Some oil tanks can be as small as 250 gallons while some can be over 30,000 gallons. The standard residential heating oil tank size is 275 gallons. You'll also notice that many smaller, above-ground heating oil tanks are manufactured in two orientations: tall (H) and wide (V). You may see, for example, that 275-gallon heating tanks listed as either 275H or 275V. An industry rule-of-thumb is that one-to-two-bedroom homes require a heating oil tank size of 275 gallons. Three-to-four-bedroom homes will need larger tanks in the 300-500 gallon range. Some homes simply don't have the space for large heating oil tanks. The amount of space you have as well as the size of your home are just two of the factors you'll have to consider when figuring out what size of heating oil tank you need. Knowing what size of oil tank to buy depends on many factors. Primarily, it depends on how much heating oil you're planning to use. Buying heating oil for your home isn't the same as purchasing gas for your car. Because you use your vehicle regularly, you're familiar with your consumption needs and can anticipate an increase or decrease in consumption. Heating oil consumption is an issue you'll likely only address once per year when it comes time to use it. This makes it harder to become familiar with your consumption needs and, in turn, the size of oil tank you'll need. Amount of space you have: Choosing an oil tank size means you have to look at how physically big the tank is. You may be thinking of getting a larger oil tank because you ran out of oil the past few winters. Well, first you need to decide if you have the space for a bigger tank. By knowing the size of the tank you have now, you can determine if there's room for a bigger one. Number of family members: If you’re a newlywed couple who just purchased a new home with a heating oil system, then you need to consider your future needs. If your family grows, you’ll be consuming more heat in the winter as there will be more bedrooms to keep toasty. Size of home: As mentioned earlier, a good rule of thumb for determining heating oil tank size is the number of bedrooms in your home. One- and two-bedroom homes need smaller tanks, while five-bedroom homes will need larger tanks. Consumption habits: If you’ve got a household full of conscious consumers, then you’ll likely be using a relatively limited amount of heating oil. You may also want to factor in any annual winter vacations you take. If you know that you’re gone every year for two weeks or longer, this means saving on heating oil consumption when no one will be home to turn on the heat. However, if you’re turning on your heat in the late spring, then your household has greater consumption needs. Emergency preparation: With Northeastern weather becoming increasingly unpredictable, it's wise to think safety first. When thinking about your fuel consumption, err on the conservative side and give yourself a 20% leeway. You never know when you'll be trapped indoors for longer than expected. Once you've thought about your family's heating oil consumption needs, you'll have a better idea of the right tank size for you. This will help when you contact a certified heating oil tank provider and installer. These professionals will assist you in purchasing the right size oil tank for you, and they'll handle the installation process too. Expert heating oil tank installers know that safety is paramount. They'll make sure that the location of your fuel tank is safe and accessible. Installers will also ensure that the tank itself is properly secured to a solid foundation or base. This is critical to preventing dangerous oil leaks. Expert heating oil tank installers will also consider climate hazards. Sudden drops in temperature can put your heating oil system at risk of freezing. Professional installation companies know how to mitigate these risks with proper industry-standard protocols. Part of the installation process is the safe removal and disposal or your old tank. If your home currently has an old underground tank, then you'll need to hire a professional oil tank removal service. Some companies offer all of these services, while others specialize strictly in removal and disposal. Unfortunately, oil leaks are a risk with older, underground heating oil tanks. That's why it's not only smart but required by law to have a professional handle your oil tank removal. These experts have the tools and equipment as well as the certification that's needed to remove the oil tank safely. Plus, these professionals can take away the old tank and dispose of it properly at qualified disposal and recycling locations. Perhaps you're not yet ready to install a new heating oil tank, and you want to use up the oil you already have in the current tank. If you've purchased a much older home, then it's possible the heating oil tank won't have a sizing label or a fuel gauge. A heating oil tank's gauge, like a gas gauge in your car, will let you know how much fuel you've consumed and how much fuel you have left in the tank. However, as mentioned, many oil tanks are outdated or are wearing out. This means they either don't have a gauge or that the gauge has stopped working. In some cases, the indicator may still look like it works, but you might not want to assume it's accurate. It's always best to conduct a calculation for yourself. If you're new to your home, then it's better to be safe than sorry. If you don't have a working gauge on your current heating oil tank, you can still figure out how much oil you have left by using the tank's measurements. In this situation, it's critical to know your oil tank's size as it's the only way to determine your fuel level. Measure Your Oil Tank Size – Gather the dimensions of your tank's height, length and width. For example, if your tank's measurements are 27 inches high by 44 inches wide by 60 inches deep, then your tank's capacity will be 275 gallons — the standard size of a household heating oil tank. Use this oil tank size chart for other oil tank dimensions. Measure How Much Oil is Left – To determine how much oil you have left, you'll need to measure your tank's current oil level. Use a hard measuring tape, a measuring stick or even a pole. You'll need any long, sturdy item that you can stick into the oil tank and measure afterward. This may remind you of how you check your engine oil as it is a similar procedure. Once you've stuck your measuring tool into the oil tank, take it out and check to see how many inches the oil covers. Using the same oil tank chart, you can determine the number of gallons left in the tank. For example, if your measuring tape told you the fuel level of your standard 275-gallon tank is at 10 inches, then this means you have 96 gallons remaining. Then you can monitor your consumption and have your new oil tank installed when needed. After you've had your old heating oil tank removed and disposed of and your new one installed, it's time to order your heating oil. Placing your heating oil order online with Smart Touch Energy is easy, convenient and reliable. With our Automatic Delivery Service, you'll never have to worry about running out of heating oil. Check your local heating oil prices today.